An analytical study of two paintings by P. S. Krøyer and the tube colours found in his painting cabinet has been carried out in order to investigate the artists’ materials used by Krøyer in the latter part of his oeuvre. The study has given a valuable knowledge about Krøyer’s choice of materials and their composition that may be helpful in e.g. preservation issues. The pigments and dyes were analysed by micro-Raman spectroscopy (MRS), scanning electron microscopy-energy dispersive X-ray spectroscopy (SEM–EDS), and high-performance liquid chromatography with diode-array detection (HPLC–DAD). The technical analyses were supplemented with archival studies of Danish nineteenth century paint shops. The results show that Krøyer used commercially available artists’ materials typical for that period in time. Being a wealthy artist, he seems to have favoured expensive pigments such as cobalt blue, viridian and cadmium yellow. Based on the analyses, the main development in Krøyer’s palette is the substitution of lead white with zinc white that appears to have taken place after 1886. The results also show that the contents of the tube colours in some cases differ from what was expected based on the trade names. This is particularly observed for the tube colours named “Oxide rouge” of which only one contains the expected hematite pigment, while all the remaining contain cadmium sulfide and natural organic red lakes. A rare tube colour named “Laque verte clair” was characterised to be mixture of Prussian blue and synthetic Indian yellow. The study therefore also illustrates that it was not always obvious to the artists what they bought from their colour merchant. It hence relates to existing international studies of nineteen century artists’ materials, which highlight the complexity of tube colours from this particular period in time. P. S. Krøyer’s portrait of Holger Drachmann and some of the tube colours used by Krøyer. Peder Severin Krøyer (1851–1909), known as P. S. Krøyer, is one of the most famous Danish painters, and a central figure in the Nordic artists’ colony established in Skagen at the end of the nineteenth century. Krøyer graduated in 1870 from the The Royal Danish Academy of Fine Arts, and early in his career he proved to have a unique talent as a portrait painter. His oeuvre counts numerous portrayals of scenes from local life and social gatherings, as well as commissioned portraits of prominent figures in the industry and the cultural life [1–3]. The commissioned works, along with his patronage and friendship with the tobacco manufacturer and art collector Heinrich Hirschsprung (1836–1908), secured Krøyer a considerable income and made him a prosperous painter [1, 2]. With Hirschsprung’s support Krøyer was able to make numerous study trips around Europe, which came to be of great influence on his career. In particular the grand tour of 4 years from 1877 to 1881 marked a turning point in his artistic style and working methods. During this tour Krøyer stayed for longer periods in Paris, where he attended classes at the atelier of the French artist Léon Bonnat (1833–1922) [3, 4]. After his return to Denmark Krøyer began to spend the summer months working in Skagen, a small fishing village in the northernmost part of Denmark that became a meeting point for Nordic artists during the 1880s . The Skagen painters, as they came to be known, found inspiration in the surrounding nature and local population in Skagen, and benefitted from the social and professional community among the artists. Their motives were most often painted “en plein air” with a clear influence from Naturalism and Realism. Today extensive collections of Krøyer’s paintings are exhibited at the Art Museums of Skagen, and at The Hirschsprung Collection in Copenhagen [1, 3]. 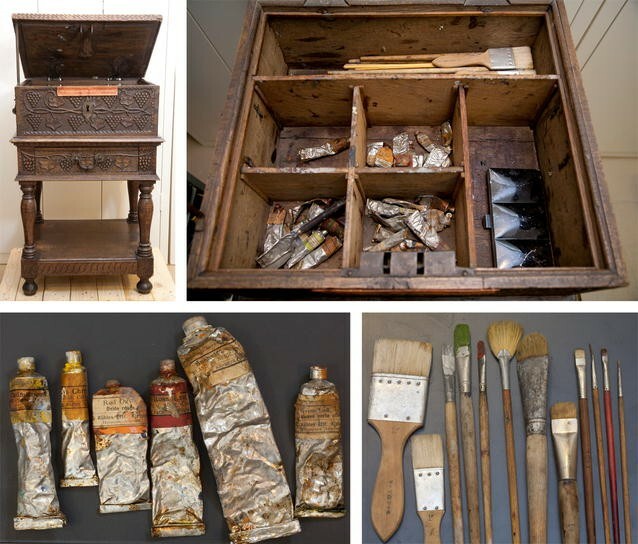 The latter is also exhibiting Krøyer’s painting cabinet. Despite Krøyer’s recognition as an artist, very little is known about his painting technique and the artists’ materials he used. Gaining such knowledge is essential in understanding how the works of art were made and how to preserve them in the best possible way. The current study is based on a technical investigation of P. S. Krøyer’s painting technique and artists’ materials, which included an examination of two of Krøyer’s paintings and the contents of the artist’s painting cabinet. No comprehensive study on this subject has hitherto been carried out, and this is the first paper giving an insight into the tube colours used by Krøyer . The analyses were carried out on samples taken from the two paintings as illustrated in Figs. 1 and 2, and on samples taken from the tube colours. Analyses of cross sections of the paint samples were performed by SEM–EDS and Raman spectroscopy in order to obtain information about the pigments used. Samples from the tube colours were analysed by SEM–EDS and Raman for identification of the pigments, and by HPLC for identification of the dyes. The two paintings, By the fireside. 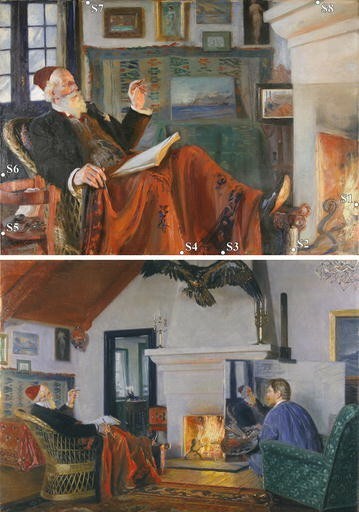 Portrait of Holger Drachmann with a red fez (hereinafter, Drachmann) and Christoffer mending nets in his living room (hereinafter, Christoffer), were painted by Krøyer in Skagen in 1903–1907 and 1886 respectively, and hence belong to the latter part of his oeuvre. Drachmann (Fig. 1, top) is one of many portrayals Krøyer did of his friend, the Danish writer and painter Holger Drachmann (1848–1908) . Krøyer’s friend and fellow Skagen-painter Michael Ancher (1849–1927) depicted Krøyer while working on the final stages of the painting (Fig. 1, bottom). It took Krøyer 4 years to complete the large portrait, which was unusual given the fact that Krøyer was known for his ability to work rapidly. At the time being though, he was struggling with mental illness, and was hospitalised several times . In contrast, the earlier portrait Christoffer from 1886 (Fig. 2, left) is an example of a rapidly executed painting, depicting a local fisherman working in a dark interior. The portrait clearly shows the influence of the realistic model painting and the concept “Valeur”, to which Krøyer was introduced during his stay at Léon Bonnat’s atelier. Krøyer gave the portrait as a gift to his friend, the French painter Ernest Baillet (1853–1902) as evidenced by the inscription in the upper left corner (Fig. 2, right). Both of the paintings are today a part of the collection at The Art Museums of Skagen. The painting cabinet (Fig. 3) has been a fixture in Krøyer’s ateliers in Copenhagen and Skagen, and it contains, among other things, 32 well preserved tube colours presumably dating from the latter part of the nineteenth century. Today it belongs to the Hirschsprung Collection who received it in 1911 as a gift from Krøyer’s estate. The paintings investigated are depicted in Figs. 1 and 2 and are: By the fireside. Portrait of Holger Drachmann with a red fez (1903–1907), and Christoffer mending nets in his living room (1886). The locations where the samples were taken are shown in Figs. 1 and 2. For ethical reasons samples were only obtained from the tacking edges and from areas with paint losses, hence not all colours could be investigated. The results of the paintings analysed are given in Table 1. Table 2 lists the trade names and brands of the 32 tube colours found in Krøyer’s painting cabinet (Fig. 3). A detailed description of the tube colours is given in “Results and discussion” (tube colours). Paint samples taken from the two paintings during conservation were made into cross sections by embedding in Technovit 2000 LC light curing resin placed in EasySections. The resin was cured for 10 min with blue light under a flow of nitrogen gas in a light-curing oven (Egger EL 1 plus N2). Finally the cross sections were polished wet with silicon carbide and then dry with Micro-Mesh (granularity 2400–12,000). The samples and cross sections were studied with an optical microscope Axio Imager M1 (Carl Zeiss) under polarised white light and ultraviolet radiation with magnifications between 100 and 500× and the use of DeltaPix Insight. MRS analyses were carried out with a Renishaw inVia dispersive micro-Raman spectrometer equipped with a 785 nm laser. The laser power was kept between 0.1 and 1 mW by neutral density filters to avoid thermal degradation. A detailed description can be found in ref . SEM–EDS analyses were carried out on cross sections and paint samples placed on double sided conductive adhesive carbon tabs using a Hitachi S-3400 N scanning electron microscope with an energy dispersive X-ray spectrometer (SEM–EDS) operating at an acceleration voltage of 20 kV and low vacuum mode at 25 Pa. The EDS system, QUANTAX 200, was equipped with two 30 mm2 SDD X-ray detectors (XFlash® 6|30 Silicon Drift Detector) from Bruker instruments. Attenuated total reflectance-Fourier transform infrared spectroscopy (ATR-FTIR) was used as supporting technique. ATR-FTIR spectra were recorded on a Perkin Elmer Spectrum One FTIR-spectrometer, fitted with a Universal ATR sampling accessory having a one-bounce composite zinc selenide and diamond crystal. Spectra of the samples were recorded over the range 4000–650 cm−1 with a resolution of 4 cm−1 and 4 accumulations. HPLC analyses were carried out after mild HF extraction (2 M aqueous HF/dimethylformamide/acetonitrile = 2/1/1). The HPLC–DAD system used for the dye analyses was a Spetra-SYSTEM from ThermoScientific, controlled by ChromQuest 4software. A detailed description can be found in ref . The results from the pigment analysis carried out on samples taken from the two paintings are listed in Table 1. In the table a distinction is made between pigments found in the ground and paint layers, and the two paintings are noted with the letter a or b, designating the portrait of Drachmann and the portrait of Christoffer, respectively. Both paintings were painted on a commercially prepared canvas with a pale white ground containing a mixture of lead white, calcite and silicate. Krøyer generally bought his canvases ready-primed . In the case of Christoffer, a canvas stamp from the paint retailer Kultorvets Farvehandel was found on the back of the canvas (Fig. 4, left). The company was established in 1879 at Kultorvet in central Copenhagen, and was run by the founder F. E. Kühle until 1890 when it was taken over by H. Averhoff . A later company label from Averhoff’s time was seen on the stretcher in the portrait of Drachmann (Fig. 4, right), indicating that Krøyer could have bought his canvases and stretchers from this particular supplier over a longer period of time. The palette used for the two paintings consisted of a mixture of traditional pigments and modern pigments developed in the eighteenth and nineteenth century. An example was seen in the use of red, orange and yellow pigments in the portrait of Drachmann, where traditional pigments and dyes like vermilion, minium and alizarin were used in combination with modern pigments like chromium orange and cadmium yellow. Vermilion, minium, alizarin, and chromium orange were identified by Raman (Fig. 5a–d) [8, 9], while the cadmium sulfide pigments were identified by SEM–EDS. Regarding the green and blue pigments, Krøyer seems to have favoured the expensive pigments viridian and cobalt blue, since these were widely represented in the analysed samples from both paintings. An example of Krøyer’s use of viridian is given in Fig. 6, where a sample taken from the Drachmann portrait is depicted. In polarised light viridian was seen as a deep dark green pigment in the upper paint layer, and in SEM the characteristic irregular rounded shape of the pigment grains was clearly visible . SEM–EDS analysis furthermore showed how the pigment was mixed with barium sulfate, probably in order to make it easier to grind and disperse . Dark blue grains of cobalt blue were likewise consistent in the samples taken from the two paintings. In one of the samples from of the portrait of Christoffer, cobalt blue was found in a mixture with minor amounts of synthetic ultramarine, the latter identified by Raman (Fig. 5e) . The sample was taken from the dark paint layers in the background (S10), and the ultramarine pigment was possibly applied as a substitute for black similar to the practice known from impressionist painters . Krøyer did not, however, avoid using regular black pigments, and carbon black was identified in both paintings by its characteristic broad Raman-bands (Fig. 5f) . The most notable difference in the palette used for the two paintings was seen in the white pigments. While Krøyer used lead white in the portrait of Christoffer, he mainly used zinc white in the later portrait of Drachmann. Zinc oxide was identified in all paint layers in the Drachmann portrait by SEM–EDS, and by optical microscopy due to the pigment’s fluorescence under UV (Fig. 7) . Analyses carried out on two of Krøyer’s early oil sketches from 1875 and 1876 (not shown) showed that lead white was used in the paint layers in both paintings, while zinc white was not. This seems to suggest that zinc white was introduced on Krøyer’s palette somewhere between 1886 where he finished the portrait of Christoffer, and 1903 where he begun painting the Drachmann portrait. Zinc white has previously been linked to a number of conservation issues due to the pigment’s strong tendency to form zinc carboxylates [13–15]. We therefore investigated the formation of zinc soap. By FTIR analysis of samples taken from the Drachmann portrait zinc soap formation as a result from reaction between the oil binder and the zinc oxide pigment was clearly seen (Fig. 8). The stretching vibrations at 2919 and 2850 cm−1, and the bending vibration at 1458 cm−1 are assigned to the long chained CH2 groups, and the vibration at 1739 cm−1 to the C=O stretching from the oil binder. The strong band at 1548 cm−1 and the shoulder at 1593 cm−1 are assigned to asymmetric COO− stretching vibrations, and the split band around 1412 cm−1 to symmetric COO− stretching vibrations. Compared to reference spectra for artificially produced zinc carboxylates i.e. zinc stearate, zinc palmitate, and zinc oleate the carboxylate stretchings are shifted towards higher wavenumbers. However, this is often the case for zinc carboxylates formed in actual paint layers where mixtures of both saturated and unsaturated zinc soaps are formed . The vast majority of the tube colours were produced by the Danish colour merchant Vilhelm Pacht, whose colours, among others, were also used by Edvard Munch . In the late nineteenth and early twentieth century the tube colours from Vilhelm Pacht were mainly retailed by the large paint shop A. Stelling, established in central Copenhagen in 1860 . Besides from Pacht, Krøyer also bought tube colours from the competing Danish colour merchant Hermann Averhoff at the shop Kultorvets Farvehandel, where he also bought canvases (Fig. 4). Only two of the tube colours found in Krøyer’s painting cabinet were from foreign companies, these being respectively the French Lefranc et Cie and the Italian Felice Alman. An investigation of price lists from Danish nineteenth century paint shops was carried out in the archives of the Royal Library of Denmark. Based on the archival information found on trade names and brands, it seems likely that the majority of the tube colours in Krøyer’s painting cabinet were bought in the last decade of the nineteenth century or later. The trade names on the tube colours were in most cases written on the label in both Danish and French. While some were rather simple and well-known names like “Cadmium yellow”, “Chromium yellow” and “Cobalt blue”, others like “Jaune Brilliant”, “Ivory black” and “Snow white” were more fanciful, but still common, examples of trade names used for artists’ colours in the nineteenth century [17–19]. Finally there were examples of trade names like “Green lake light”, “Red oxide”, and “Cadmium lemon yellow”, where the results showed no clear correlation between trade name and contents. An overview of the results from the analysis carried out on the contents of the tube colours is presented in Table 3. In many cases the trade name on the label proved to correspond to the pigment(s) found in the tube colour. An example was the analysis of the tube colour named “Chromium yellow light”, where Raman identified chrome yellow as the primary pigment (Fig. 9a) [8, 9]. The small band seen at 1054 cm−1 in the Raman spectrum can be assigned to the presence of lead carbonate or basic lead carbonate , which suggests that lead white was added to the colour in order to obtain a lighter shade of yellow. This, however, appears to be unusual since lead sulfate has traditionally been the most common addition to colours based on chrome yellow . The tube colour containing chrome yellow and the tube colour labelled “Cadmium lemon yellow” which contained the extremely rare cadmium chromate pigment , were the only two tube colours where chromate pigments were found. All the remaining yellow tube colours were cadmium sulfide based colours. To what extent Krøyer has used chromate pigments is unclear based on the two paintings analysed. Chromium orange, PbCrO4·PbO, was found in three samples from the Drachmann portrait (S2, S3 and S5), but a tube colour containing this pigment was not present in the painting cabinet. Thus, more paintings have to be investigated in order to find out, which role chromate pigments played in Krøyer’s palette. The instability of the chromate pigments was already in the nineteenth century well known among artists [22–24], which makes it a possibility that Krøyer deliberately avoided using them to a greater extent in his paintings. In relation to the stability of chromate pigments the analysis of the two tube colours labelled “Chrome green light” and “Chrome green medium” should be noticed. The name “Chrome green” has typically been used for the mixture of chrome yellow and Prussian blue [20, 25], but in this case the tubes contained a mixture of viridian, zinc yellow, cadmium sulfide and barium sulfate. It seems very likely, that the manufacturer changed the composition of the colour in order to create an alternative to the traditional “Chrome green” based on more durable pigments. Similar examples have been reported by Townsend et al. . In general durability seems to have been an important matter to Danish colour merchants in the end of the nineteenth century. The tube colours from Vilhelm Pacht were ranked in the price lists (Table 2) as being either completely durable (HH), durable (H) or uncertain (without a letter). Among the 32 tube colours in Krøyer’s painting cabinet, 6 tubes contained lake pigments indicated by their trade names. One tube labelled “Green lake light” showed a surprising result, whereas the remaining five tubes with trade names for various shades of red madder and carmine contained the expected dyes based on their names and the artists’ materials available in this period. The single tube colour labelled “Green lake light” contained a mixture of yellow dyes precipitated on aluminium and barium sulfate containing substrate, and a blue pigment identified as Prussian blue (Fig. 9b) by Raman analysis (2155, 2092, 538, and 278 cm−1) . By HPLC the yellow dyes were identified as Naphthol yellow S together with a smaller amount of Auramin O and Martius yellow (Fig. 10a). Naphthol yellow S precipitated on aluminium and barium sulfate was found to be similar to a synthetic Indian yellow prepared by Winsor and Newton (reference sample archived at Laboratories of IRPA/KIK since the 1950s), hence the “Green lake light” could be described as a mixture of Prussian blue and synthetic Indian yellow. Four tube colours had trade names for variant shades of red madder i.e. “Madder lake golden rose”, “Madder lake deep rose”, and “Madder lake rose”. In the first mentioned HPLC-analysis identified the organic colourants to be purpurin and pseudopurpurin, which could be interpreted as Kopp’s purpurin  precipitated onto a substrate containing calcite and talc. Purpurin and alizarin were identified in the latter two, confirming a madder-based product best described as garancine [27, 28]. In the tube labelled “Carmine lake ordinary”, carminic acid was identified (Fig. 10c) showing that this lake was actually prepared from cochineal insect . Together with carminic acid, another unknown red dye compound was found, which perhaps indicates the extraction method of cochineal, but its significance is unclear. Six tube colours, one from Vilhelm Pacht and five from Hermann Averhoff, were all labelled “Red oxide”. Despite having identical trade names and almost identical colours, the analysis showed a considerably variation in the contents of the tubes. Only one of the five tube colours from Averhoff was found to contain hematite as the main pigment as expected by the trade name (Fig. 9c). The remaining four all contained cadmium sulfide, and hence showed a discrepancy between trade name and contents. In addition all five tube colours contained red lakes based on the identification of typical mordants Al, P, and Sn [28, 30, 31]. The “Red oxide” from Pacht likewise contained a mixture of cadmium sulfide and a red lake identified by Raman as alizarin (Fig. 9d) and by HPLC as purpurin and alizarin (not shown). The cases of the “Green lake light” and the “Red oxide” are just a few examples of the complexity that relates to artists’ colours from the 19th century . A clear correlation between trade name and contents is not always seen, and consequently artists have often not had a sound knowledge of the colours they used. Given the fact, that most of the tube colours in Krøyer’s painting cabinet were probably bought in the last decades of Krøyer’s life, it seemed reasonable to draw a line between the tube colours and the paintings from the latter part of Krøyer’s career. Especially the large portrait of Drachmann, finished only 2 years before Krøyer’s death in 1909, seemed to be closely linked to the tube colours found in the artist’s painting cabinet. Cadmium sulfide pigments, viridian, cobalt blue and zinc white were all examples of pigments found in both Krøyer’s portrait of Drachmann and in a number of his tube colours. Zinc white appears to have been an important part of Krøyer’s palette in the latter part of his career [4, 32]. In the analysed samples from the Drachmann portrait, zinc white was present in all paint layers where it was applied in mixtures with a wide variety of other pigments. Moreover the colour “Snow white” containing zinc white pigment was the only white tube colour present in the painting cabinet. A part from the pure white tube colour, zinc white was only identified in one other tube colour, this being “Jaune brilliant” where it was mixed with cadmium sulfide. It thus looks as if Krøyer himself intentionally blended zinc white into his colours on the palette in order to lighten the variant shades, as zinc white was present in all areas of the portrait of Drachmann. Some pigments like chromium yellow and cadmium chromate  were only found in the tube colours. It is uncertain to what extent Krøyer has actually used these pigments in his paintings. Further analyses of other paintings by the artist could possibly provide information with regard to this question. In contrast the pigments vermilion, minium and chromium orange were all identified in the Drachmann portrait, whereas they were not present in any of the tube colours in the painting cabinet. This emphasises that conclusions about an artist’s painting materials cannot be drawn based on access to the materials alone without including analyses of the paintings themselves. The analyses carried out on the samples from the two paintings and the tube colours have given an insight in the painting materials used by Krøyer in the latter part of his career, e.g. the pigments applied on his palette, and his favourite brand in tube colours and colour merchants. In general Krøyer used the commercially produced artists’ materials that became available from colourmen during the nineteenth century. The canvases were bought ready grounded, either on the stretcher or by the metre, and the composition of the ground consisted of lead white, calcite and silicate. Krøyer’s palette consisted of both traditional pigments and modern ones developed in the eighteenth and nineteenth century, among these, several pigments containing chromium, cadmium and cobalt. In general the pigments found in Krøyer’s paintings and tube colours were expensive reflecting that Krøyer was a well-established and wealthy artist, who did not have to choose the cheaper alternatives. A noticeable change in Krøyer’s palette seems to have taken place somewhere in between 1886 and 1903, where lead white was replaced with zinc white. The tube colours found in Krøyer’s painting cabinet were primarily from Danish colour merchants, with the majority from the colour manufacturer Vilhelm Pacht. Krøyer’s tube colours had trade names typical for artists’ paints used during that period of time. In most cases the pigment(s) found in the tubes matched what would be expected based on the trade name. However, notable exceptions were found, such as the rare cadmium chromate pigment present in the tube colour “Cadmium lemon yellow” , as well as the “Green lake light” and “Red oxides” described above. This illustrates that it was not always obvious to artists what they bought from their colour merchant. The fact that some pigments were found in the paintings, but not in any of the tube colours in the painting cabinet and vice versa, emphasises that conclusions about an artist’s painting materials cannot be drawn based on access to the materials alone without including analyses of the paintings themselves. The authors would like to thank The Art Museums of Skagen and The Hirschsprung Collection for kindly allowing investigation and sampling of Krøyer’s paintings and tube colours respectively. Furthermore, we wish to thank Cecile Glaude and Alexia Coudray from IRPA/KIK for assistance with the instrumental analyses, and curator Mette Bøgh Jensen from The Art Museums of Skagen for reviewing the art historical contents of the article. Finally, we thank Foundation Idella, Marie Månsson’s Foundation, and the School of Conservation Firenze grant, for making first authors research stay at IRPA/KIK in Brussels, Belgium possible.